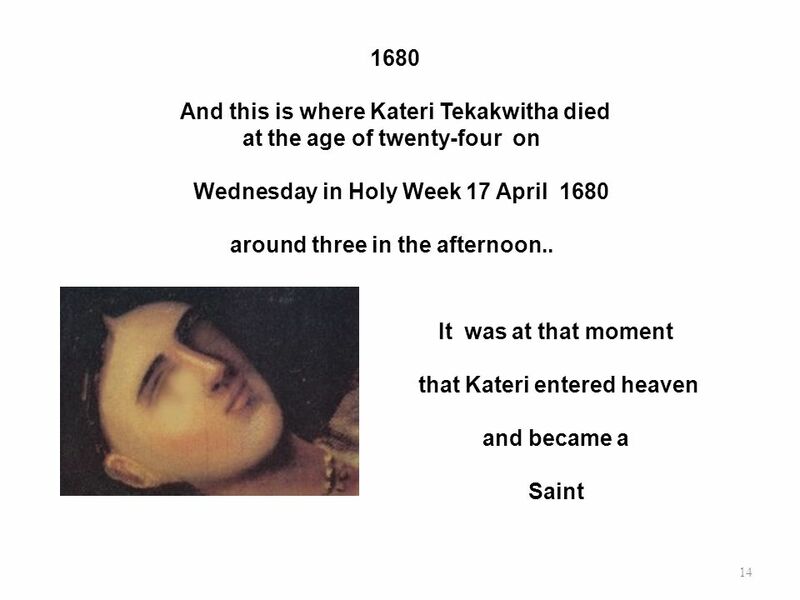 1680 Kateri Tekakwitha died at the age of twenty-four on Wednesday in Holy Week, April 17, 1680 around three in the afternoon. Two men passing by her longhouse came in to see this young lady about whom the entire village was proclaiming to be a Saint. What they saw amazed them! Her confessor the Jesuit priest and Kateri’s companions were also amazed and edified at what happened! 3 A miraculous event took place just fifteen minutes after her death. 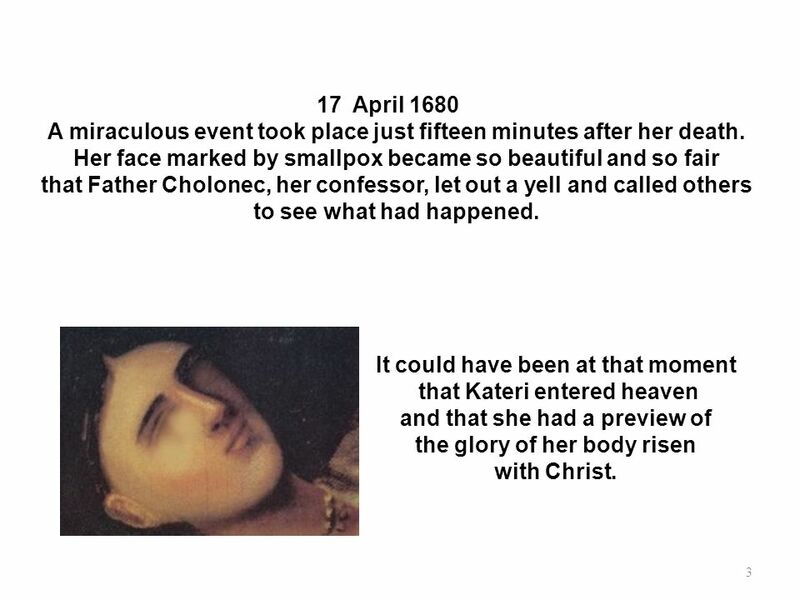 17 April 1680 A miraculous event took place just fifteen minutes after her death. Her face marked by smallpox became so beautiful and so fair that Father Cholonec, her confessor, let out a yell and called others to see what had happened. It could have been at that moment that Kateri entered heaven and that she had a preview of the glory of her body risen with Christ. 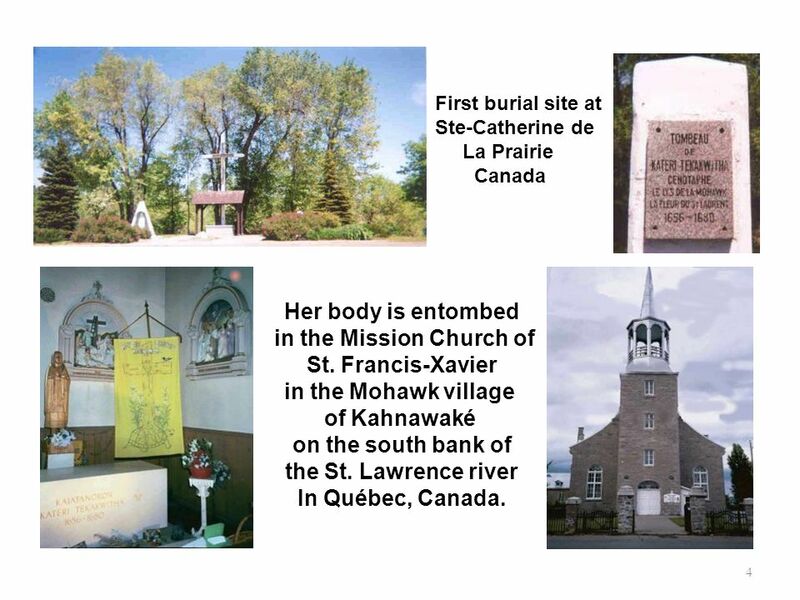 First burial site at Ste-Catherine de La Prairie Canada Her body is entombed in the Mission Church of St. Francis-Xavier in the Mohawk village of Kahnawaké on the south bank of the St. Lawrence river In Québec, Canada. 5 After her death, there were so many miracles attributed to her! 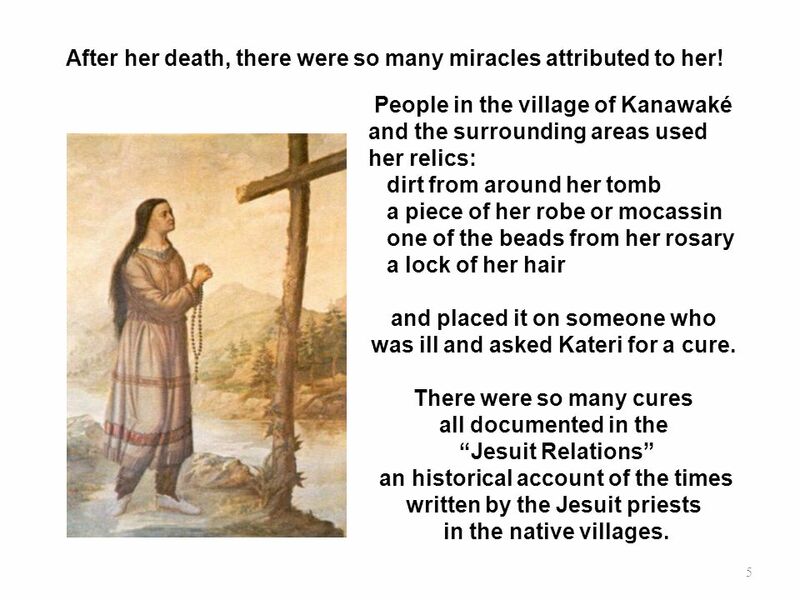 People in the village of Kanawaké and the surrounding areas used her relics: dirt from around her tomb a piece of her robe or mocassin one of the beads from her rosary a lock of her hair and placed it on someone who was ill and asked Kateri for a cure. There were so many cures all documented in the “Jesuit Relations” an historical account of the times written by the Jesuit priests in the native villages. 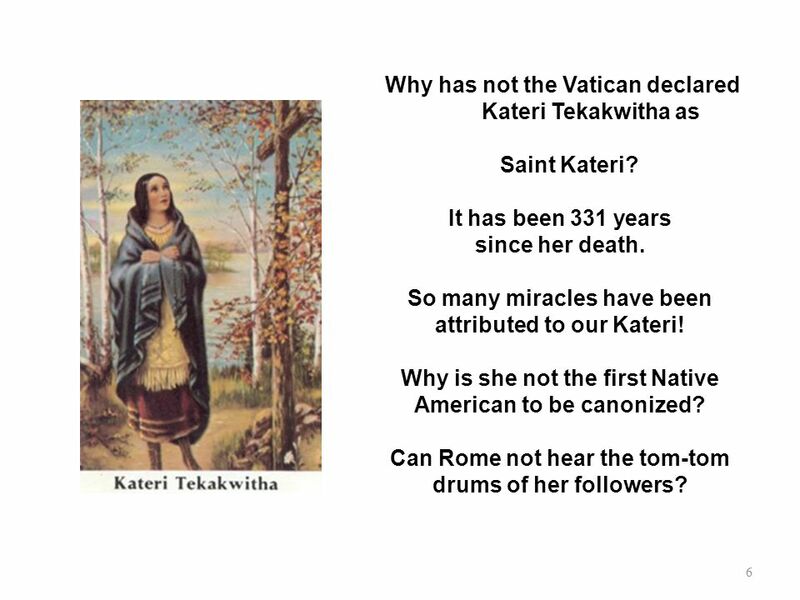 6 Why has not the Vatican declared Kateri Tekakwitha as Saint Kateri? It has been 331 years since her death. 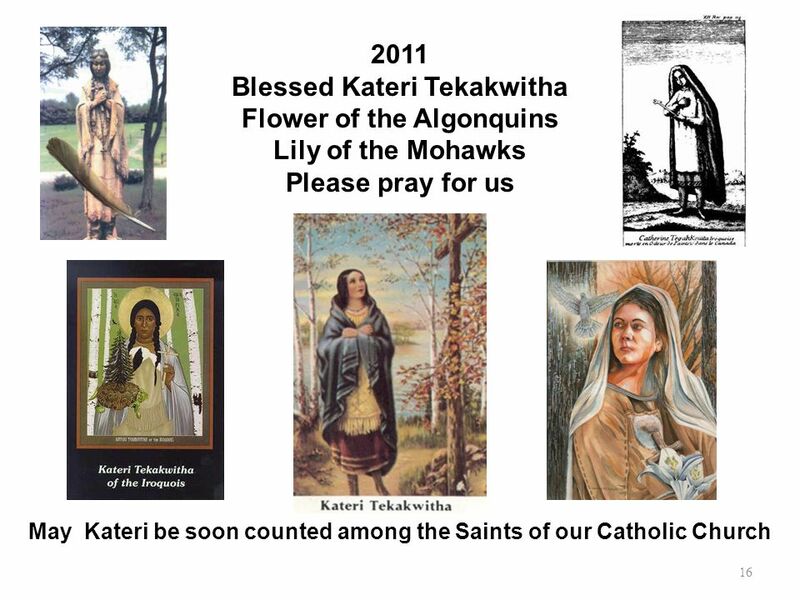 So many miracles have been attributed to our Kateri! Why is she not the first Native American to be canonized? Can Rome not hear the tom-tom drums of her followers? O God, who, among the many marvels of Your Grace in the New World, did cause to blossom on the banks of the Mohawk and of the St. Lawrence, the pure and tender Lily, Kateri Tekakwitha, grant we beseech You, the favor we beg through her intercession, that this Young Lover of Jesus and of His Cross may soon be counted among the Saints of Holy Mother Church, and that our hearts may be enkindled with a stronger desire to imitate her innocence and faith. Through the same Christ Our Lord. Amen. Blessed Kateri Tekakwitha, pray for us. 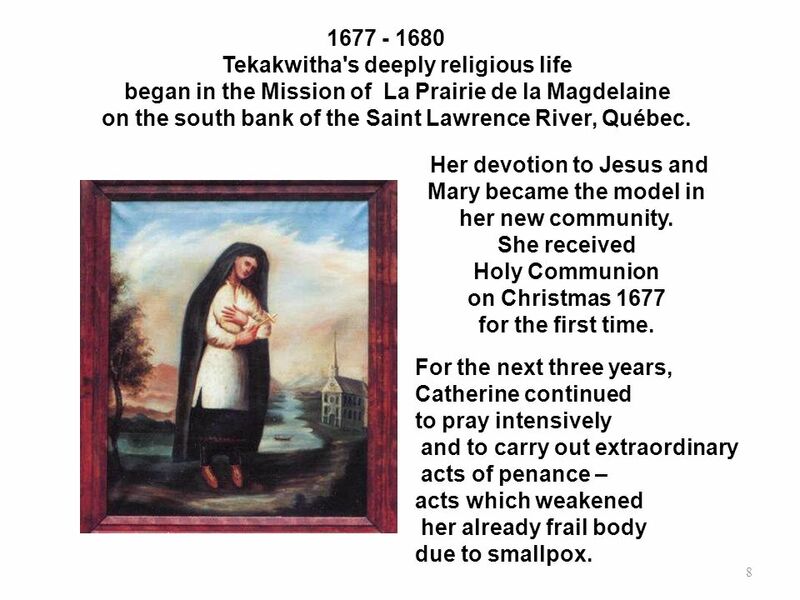 Tekakwitha's deeply religious life began in the Mission of La Prairie de la Magdelaine on the south bank of the Saint Lawrence River, Québec. Her devotion to Jesus and Mary became the model in her new community. She received Holy Communion on Christmas 1677 for the first time. For the next three years, Catherine continued to pray intensively and to carry out extraordinary acts of penance – acts which weakened her already frail body due to smallpox. 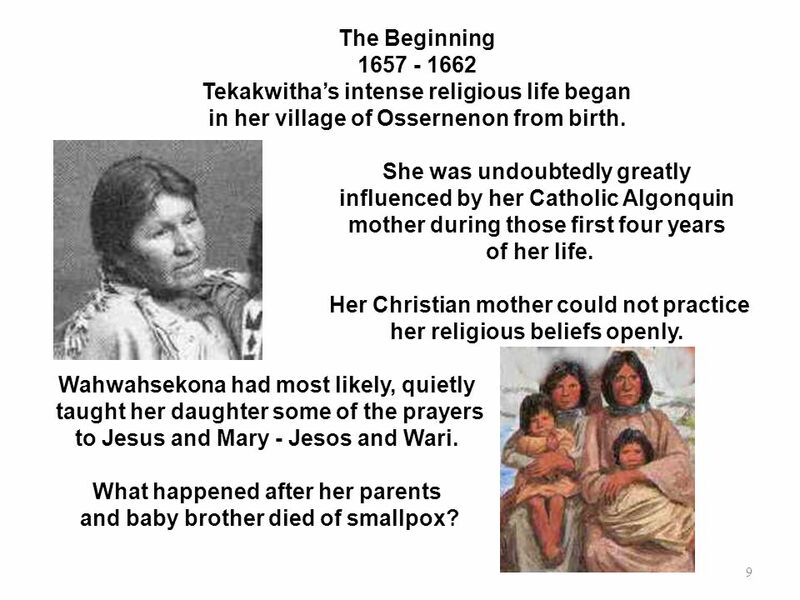 The Beginning Tekakwitha’s intense religious life began in her village of Ossernenon from birth. She was undoubtedly greatly influenced by her Catholic Algonquin mother during those first four years of her life. Her Christian mother could not practice her religious beliefs openly. Wahwahsekona had most likely, quietly taught her daughter some of the prayers to Jesus and Mary - Jesos and Wari. What happened after her parents and baby brother died of smallpox? After smallpox devastated the village of Ossernenon, her tribe moved across the Mohawk River to a new village Caughnawaga. There, she could not practice her religious beliefs. 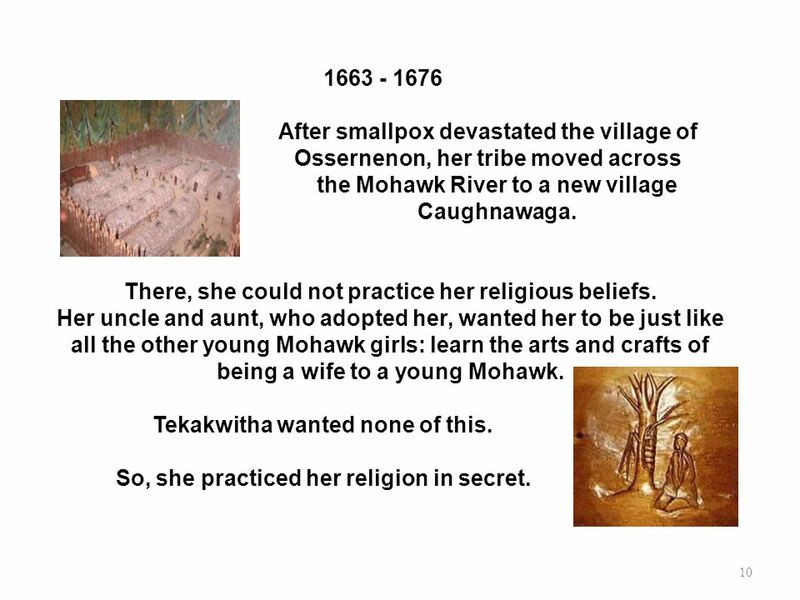 Her uncle and aunt, who adopted her, wanted her to be just like all the other young Mohawk girls: learn the arts and crafts of being a wife to a young Mohawk. Tekakwitha wanted none of this. So, she practiced her religion in secret. 11 Kateri - Gahdehlee - Iroquois for Catherine. Father Jacques de Lamberville, in 1674, accidentally came into her uncle's longhouse seeking information. Tekakwitha had enough strength to ask him if she could learn about his Christian God. 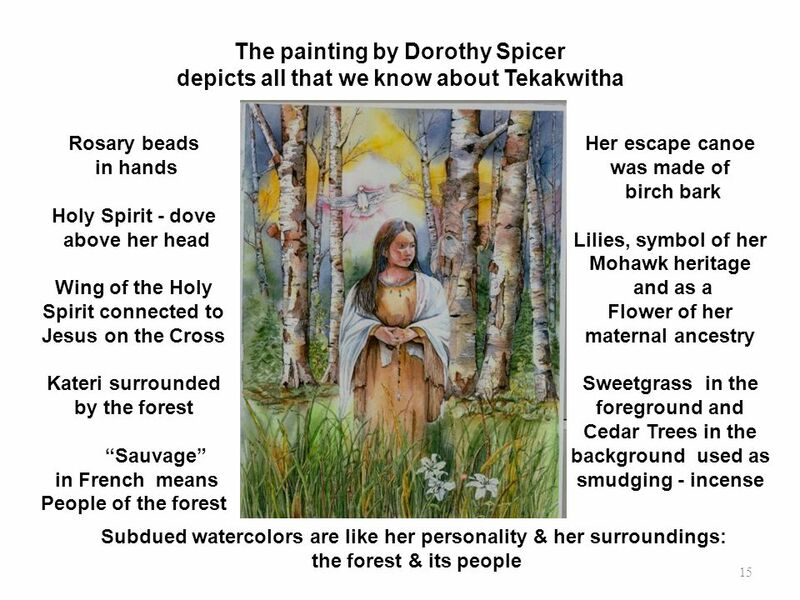 On Easter Sunday, April 5, 1676, Tekakwitha was baptized in the Catholic Church, at St. Peter's Mission in Caughnawaga. 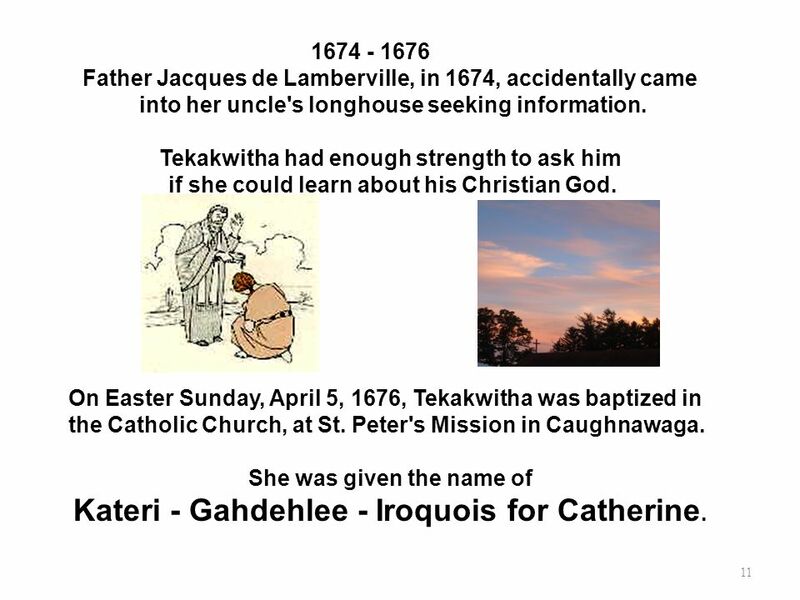 She was given the name of Kateri - Gahdehlee - Iroquois for Catherine. 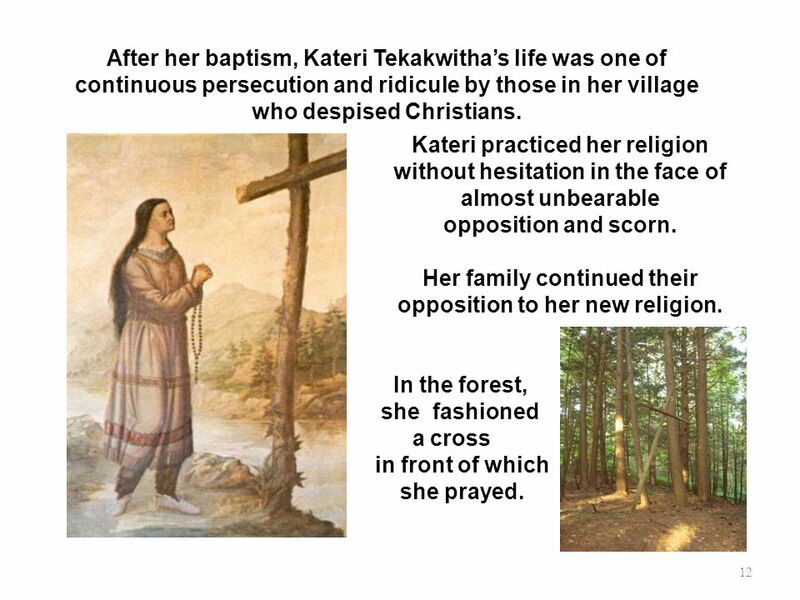 After her baptism, Kateri Tekakwitha’s life was one of continuous persecution and ridicule by those in her village who despised Christians. Kateri practiced her religion without hesitation in the face of almost unbearable opposition and scorn. Her family continued their opposition to her new religion. In the forest, she fashioned a cross in front of which she prayed. 13 Word was sent to Tekakwitha that she was invited to come there. 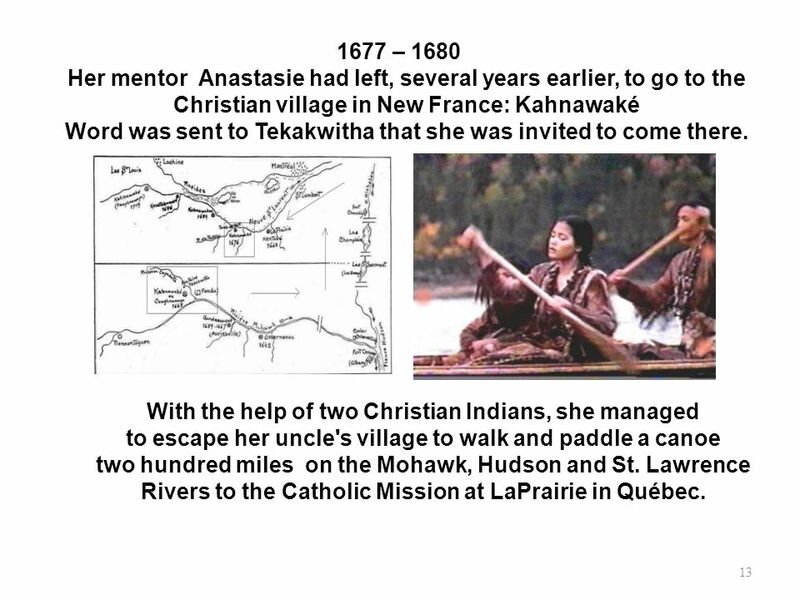 1677 – 1680 Her mentor Anastasie had left, several years earlier, to go to the Christian village in New France: Kahnawaké Word was sent to Tekakwitha that she was invited to come there. With the help of two Christian Indians, she managed to escape her uncle's village to walk and paddle a canoe two hundred miles on the Mohawk, Hudson and St. Lawrence Rivers to the Catholic Mission at LaPrairie in Québec. 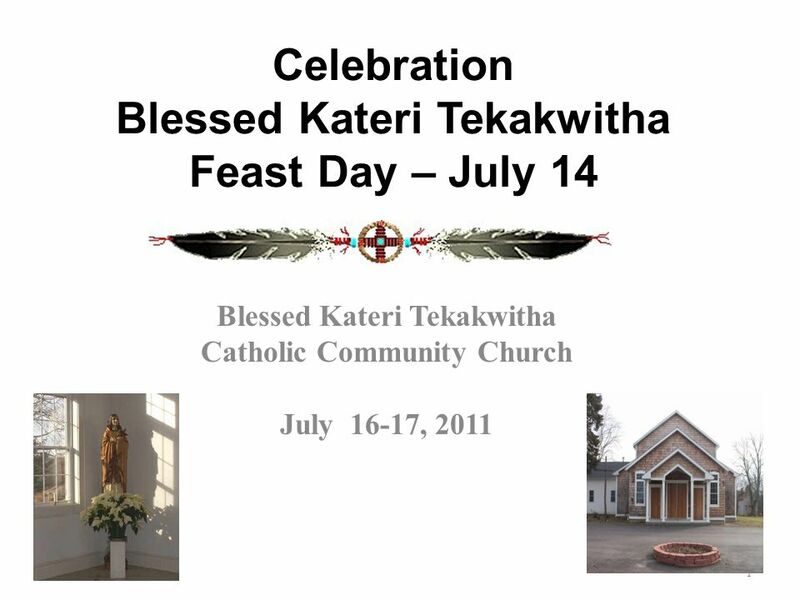 Download ppt "Celebration Blessed Kateri Tekakwitha Feast Day – July 14"
SAINT KATERI TEKAKWITHA Canonization October 21, 2012. Celebration of the Sacrament of Baptism. Process of a Sacrament, what it includes = the Rite. What’s so special about the month of October? 1 SISTER MARTA WIECKA Daughter of Charity on the road to sainthood. YEAR 4 Local Church – Community COMMUNITY. YEAR 4 Local Church – Community COMMUNITY LF1 Jesus chooses people to work with him LF2 The parish community. Two Sacraments of Initiation into the Catholic Church Baptism & Confirmation Year 9. Saint Cecilia Patron saint of musicians Feast day: November 22. Learning about Prayer with St. Kateri Tekakwitha October, 2012 Parent Drop-in Session. Mary MacKillop. Personal Information Name: Mary Helen MacKillop Date of birth:15 January 1842 Place of Birth: Fitzroy, Melbourne Gender: Female Religious. Why say the Rosary We learn our prayers. One of the coolest things about the rosary is that you knock out six prayers in one. The prayers in the rosary. The Holy Rosary. The blessed Virgin Mary shall be called blessed today as much as she was called blessed in the days that followed the glorious birth. “ “I have come so that they may have life and have it to the full.” ( Gospel of John) 2010.